I've tried to find it a few times by Google, no luck. I read it at my public library once in highschool (15 years ago? ), it was in the fantasy section, right in the middle so I assume the author was somewhere in the middle of the alphabet. It's a small library so they get rid of books that aren't read much.There was only the one book at the library but it may have been part of a series. It was hard cover, the book jacket was pale - tan with purple or something . Plot: this group of women, one of the main characters in charge, meets with this group of male soldiers, the leader of which is the other main character. They might be mercenaries. One group is being hired by the other or it's a mutually beneficial deal. Its a secret meeting. At some point there's a ship wreck. I have this really vivid scene of a storm, and a cliff with this outcropping of rock on it. They string a rope to this outcropping and everyone is shimmying up the rope to safety from the ship, but the rope wears through and breaks. The lead lady wraps the ends around her hands and uses herself as the anchor on the rock, but of course the men are heavy and the rope cuts her hands horribly before they're all across. And there's somehow a bird involved, a falcon or other bird of prey, but I don't remember how. 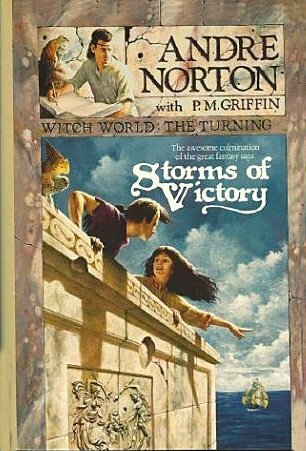 Dana suggests in the question that this is Storms of Victory by Andre Norton, and indeed it is. The rope! There was a strangeness in its motion, an added violence in each jerk that it gave. Desperately, her eyes ran its length from the wrecked merchantman to the place where it was bound to the ledge. Una grew pale as death. The line had slipped, not far, but enough that it was now in contact with the axe-sharp ridge of stone. With every motion made by that unsuspecting seaman out there, another few strands parted. Only moments remained before his support was entirely severed. She called out to those below her but knew she had not made herself heard. What could she do? She doubted she could so much as reach the lower ledge before the rope went. With the speed of desperation, she leaped and caught hold of it. The break was in the coil, and enough length remained that a man might have refastened it or at least have drawn it about the pillar so that the stone would have taken the most of the mariner's weight. Una's strength was not sufficient for that. She twisted the line about each of her hands, then cast her arms around the rock, thus completing the loop with her own body, in the very moment that the rope finally parted. She screamed as it jerked tight on her hands. The pain was incredible, unbearable, yet she must endure it or see the rest of those people die, see Tarlach die and make his death a nearly useless gesture. Help find a novel with a female heroine from, at latest 1990 in a two part novel?